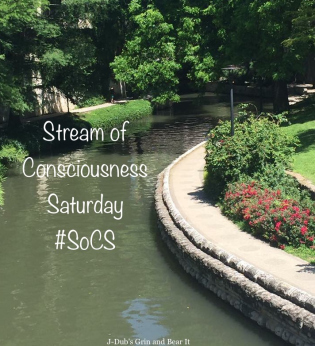 SoCS – there. are. doors. everywhere. I hustled up the sidewalk and pressed the bell, shifting my weight side to side as I listened to the sound of a ringing phone. That’s the sound of the elementary school’s call button – brrriiiiiiiinnnnnngggg, brrriiiiiiiinnnnnngggg – and I wondered how many tasks the office staff was juggling first thing in the morning along with buzzing me in. I awkwardly wondered, as I always do, whether to stare into the camera or look straight ahead at the door. Both seem a little rude. I remember the days before buzzers. The days when I walked into the school office and signed in, like I naively assumed everyone would, before heading off to volunteer in a classroom. Those days when kids didn’t think twice about seeing strange adults in the hallways. Columbine happened five years before T-man was even born, but it was a shock to the system nonetheless. The Virginia Tech shooting happened when my kids were three and one, and I was terrified to think of college campuses as a hunting ground. But then Sandy Hook ripped me wide open. T-man was in second grade with Bear right down the hall in first. They were babies to me, barely a breath older than those young ones killed in Newtown, and I could. not. stop. thinking. How wide open and exposed our school was. How anybody could waltz in off the street with only a “please sign in at the front office” note to direct them. How there are doors everywhere, what with two buildings of classrooms and a separate gymnasium. We started talking at PTA meetings about securing the campus. A lot. The wheels turn slowly in a school system and it took f-o-r-e-v-e-r to get those camera equipped lockdown doors at the three main entrances, but now they’re in place. I walk through those doors twice a week, every week, and am flooded with school sights and smells. Littles waiting in line for the bathroom. Pairs of students returning a basket of books to the library. Kids sitting elbow to elbow at cafeteria tables, laughing about whatever nonsense is up that day. Schools getting on with the business of being schools. And I pray that’s all I ever have to see in those hallways. Linda’s stream of consciousness prompt this week is “door.” Her instructions are to write about a door you walked through this week that wasn’t your own. Pop on over and check out her blog! That’s so true. There are no real ways to lock down a public building entirely…the thought is almost paralyzing. It’s a sad statement of where our society has gone to have locked doors, walls, fences, armed guards at our schools. Sadder still, I think would be armed teachers – making school much like a prison. It is a sad thing that the children in schools have to be locked up tight in order to protect them. In South Africa it is the norm as schools are surrounded by high fences and locked gates. Does that work? I mean to say, do they feel safe (or safer)? It has been happening for so long it is a way of life. It doesn’t always stop undesirable people from entering the school though.